Raigad is one of the most important forts in the history of Marathas, being the first capital of independent Marathi kingdom or �Hindavi Swarajya�. Graded as the most secured and most appropriate location by the King himself, the fort stands proudly showing the strength of the Maratha Empire. Raigad fort is situated 25 km north of the modern day Mahad town. Being situated comparatively near to the sea, with Mahad being in reach, and at same distance from Mumbai, Pune and Satara, Raigad enjoyed a strategic position. Moreover, it is an important link between the Deccan plateau and the coastal Maharashtra. Raigad is well surrounded by mountains and was considered secured. The fort is surrounded on its north and east by Kaal River, and Gandhari River flows from its west side. Fort Lingana is situated to the east side and Kokandiva to the north. If the skies are clear, we can see Rajgad-Torna on the east and Pratapgad, Vasota and Makarandagad on the south. Raigad, Rairi, Islamgad, Nandadeep, Jambudweep, Tanas, Rashivata, Badenur, Raigiri, Rajgiri, Bhivgad, Reddi, Shivlanka, Rahir and Gibraltar of the east. The fort was initially used to keep prisoners during the Nizamshahi rule. It was then ruled by the More clan of the Javli region. On 6th April 1656, Shivaji Maharaj besieged Rairi and captured it in May. The then Subhedar of Kalyan was transporting the treasure of Adilshah to Bijapur, which was raided by Marathas and utilized to fortify Raigad. �राजा खासा जाऊन पाहता गड बहुत चखोटा. चौतर्फा गडाचे कडे तासिल्याप्रमाणे दिड गाव उंच. पर्जन्यकाळी कडियावर गवत उगवत नाही आणि धोंडा तासीव एकच आहे. दौलताबाद पृथ्वीवर चखोट गड खरा, परंतु तो उंचीने थोडका. दौलताबादचे दशगुणी उंच असे देखोन बहुत संतुष्ट झाले आणि बोलिले, तक्तास जागा हाच गड करावा�. Shiv Raajabhishek (The Coronation ceremony of Shivaji Maharaj) was the most significant event in the history of India. Shivaji Maharaj became the King of the newly formed Maratha kingdom after a struggle of more than 300 years. Shivaji Maharaj took the blessings of Bhavani Mata of Pratapgad on 19th May 1674 and offered a golden umbrella (Chatra) worth Rs. 56,000 to the goddess before the ceremony. The ceremony took place on the auspicious day of 6th June 1674, which was a Saturday. On 24th September 1674, Shivaji Maharaj underwent another ceremony for coronation for the commoners. This was done by Nischalpuri Gosavi. Kavi Bhushan has aptly written an extended description of this fort in his works. On 4th February 1675, Sambhaji Maharaj�s thread ceremony took place on Raigad, and on 7th March 1680, it was Rajaram Maharaj�s ceremony. 8 days later Rajaram got married to Prataprao Gujar�s daughter. On 3rd April 1680, Shivaji Maharaj passed away on this fort, which was the most devastating moment for the Maratha regime. On 16 February 1681, Sambhaji became the crowned king of Maratha Empire. Aurangzeb started his conquest of Raigad in 1684, and dispatched Shahabuddin Khan with an army of 40000. He plundered the villages in vicinity like other Mughals and returned in 1985 without attacking Raigad. Zulfikarkhan followed suit and besieged Raigad on 25th March 1689. On 5th April Rajaram escaped to Pratapgad. Finally, on 3rd November 1689, Mughals captured Raigad due to treacherous Suryaji Pisal. They renamed the fort as Islamgad. Marathas regained it on 5th June 1733. Raigad is one of the important forts which exhibits the intelligent architecture adopted by Marathas in 17th century. Shivaji Maharaj built this palace for Jijamata in Pachad in her later days, where she preferred to stay instead of high altitude forts. The remnants are intact and there is a memorial of Jijamata. The well where she used to take rest along a stone cut rest is called �Takyachi Vihir�. Nana Darwaja or �Nane� Darwaja is a relatively smaller entrance, and is another way to ascend to the top. The framework is can still be seen with the latches for the door and the vestibules for guards. On the trail from Chitta Darwaja towards Mahadarwaja, we come across the tomb of a fakir called Madanshah. There are few remnants like resting place for guards and a granary here. There is an old canon here and there are 3 stone carved caves. This is an architectural masterpiece, and only few forts have such secured entrances. This entrance is typically a �Gomukhi� entrance protected by bastions Jai and Vijay, each one being about 70 ft high. The attacking enemy cannot directly march on the door and face the bastions first. The ramparts are built from here to Hirkani point on west and Takmak on east. There are two lotus figures carved on the door, which indicate prosperity and knowledge. This is a secret entrance which is near the wall which connects Mahadarwaja to Takmak point. As we enter Mahadarwaja, we come across this pond, which is said to be used for bathing elephants. There are remnants of 2 pillars before entering the citadel complex of the fort as we proceed ahead of Gangasagar. These pillars were said to be almost 5 storey high and seem majestic from the remaining carvings. These are polygonal with 12 sides and are supposedly mentioned in the stone scripture in Jagdishwar temple complex. Palkhi Darwaja is the north entrance to the citadel after climbing 31 rock stairs. This was intended for men to enter the palace. There are six spacious houses on the western side of the citadel called Queens Palace. In front of the Queen�s palace is the palace of Shivaji Maharaj, which is 86 feet long and 33 feet wide. It was said to be built of wooden structure, of which today only the base of pillars remains. On the northern side of Rajbhawan is a pillar, adjoining which is a room in the basement which is called �Ratnashala�. This seems to be used as a secret chamber. This is the court on the fort which is a huge building, around 220 ft long and 124 ft wide. The throne of Shivaji Maharaj is east facing, and today we can see a memorial there. The coronation ceremony occurred in this place and the majestic throne was meant to be made of 32 maunds of gold (1194 Kg of gold) and studded with diamonds. Mena Darwaja is the southern entry to the citadel. Nagaarkhana is the main entry to the court, and as its name suggests, the loft on this building was used to play huge drums or �Nagaare� during certain times in a day. This one is the tallest monument on the fort. Goddess Shirkai is the deity of the Shirke dynasty, and was worshipped equally by others. If we exit from Nagaarkhana and process towards �Holicha Maal�, we see this temple and further the gallant statue of Shivaji Maharaj. Raigad being an important fort, we find multiple cisterns, ponds and lakes here. Kushavarta is one major cistern which lies near �Holicha Maal�, and there is a Shiva temple nearby. Ahead of Holicha Maal, there is a well-designed complex of medieval shops (as the folklore tells us). This supposed marketplace might be trade centres as per expert historians, where only deals were done and was not a conventional market. These symmetrical structures have 22 rooms on one side and 21 on the other, separated by 40 ft road. Whether these are houses or commercial centres, is a matter of debate amongst experts. There is a snake carved on the outer wall of one of the structures. Takmak point is the northwest facing cliff of the fort, which is ahead of Bajarpeth when we go from Holicha Maal. This was supposed to be used as a cliff to punish prisoners by toppling them from the top. This being a narrow part and considering the wind here, one has to be careful at this point. Bhavani point is the eastern cliff of the fort, and we can see Lingana pinnacle on the north east, forts Torna-Rajgad on distant horizon and the Potlya hill on the south. When we proceed towards the palaces, we come across the ZP rest houses. Beyond these is this pond which was named Gangasagar because the waters from seven rivers of India which were brought for the coronation ceremony of Shivaji Maharaj were poured into this pond. This is the main source of drinking water today on the fort. 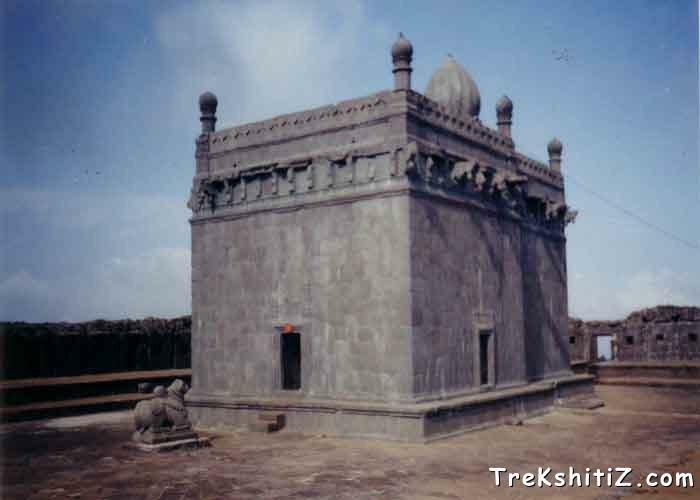 On the outer wall of the temple on east side, there is a stone inscription which means � �This majestic building of Jagdishwar which brings happiness to all is built on the word of Shivaji Maharaj on the auspicious muhurtam in Hindu year of 1596. The architect by name Hiroji built all wells, ponds, gardens, roads, pillars, monuments and palaces. These will remain till the sun and moon are there in the skies�. This Samadhi is built near the temple entrance on the east. Shivaji Maharaj passed away on the 15th day of first month and year 1602 of Hindu calendar (April 3rd 1680). As per Sabhasad Bakhar, this is built near the very Jagdishwar temple which he created. The memorial is octagonal and the porch is made from black stones. The base is hollow inside, where the ashes of Shivaji Maharaj are kept. There are remnants of a house beyond this in which it is said that Henry Oxendan had stayed. This is a tough exit from the fort, to enable escape in case the fort was captured, and a rope would be required to descend from here. This is the route from where Rajaram Maharaj escaped when Zulfikar Khan attacked the fort. Hirkani point is the western point of the fort, and is named after a brave woman by name �Hirkani�. Folklore tells that the woman used to supply milk on the fort during the regime of Shivaji Maharaj. The doors to the fort would be opened at sunrise every day and would be closed at the sunset. Once she was late to return and the doors were closed. The love for her kid in the village compelled her to descend from the fort from the side of western cliff, and reached her home successfully. The story spread through, and Shivaji Maharaj recognized her efforts and bravery by felicitating here. He also strengthened this part so that no one can ascend from here again. Raigad being situated 30km to the north of Mahad, ST buses ply regularly from Mahad. There are buses from Mumbai Central and Pune which ply to Mahad or Raigad via Mahad. We can ascend Raigad either by walk or by ropeway. If we want to ascend the fort by walk, we can go from Chitta Darwaja or Nana Darwaja and we reach MahaDarwaja. It takes about 2 hours to reach the top. If we reach the top of the fort by ropeway, it takes only 15-20 minutes. However, wait time for ropeway depends on the crowd. MTDC rooms and dormitories are available and can be booked by calling MTDC Mumbai office. There are ZP rooms also on the fort.